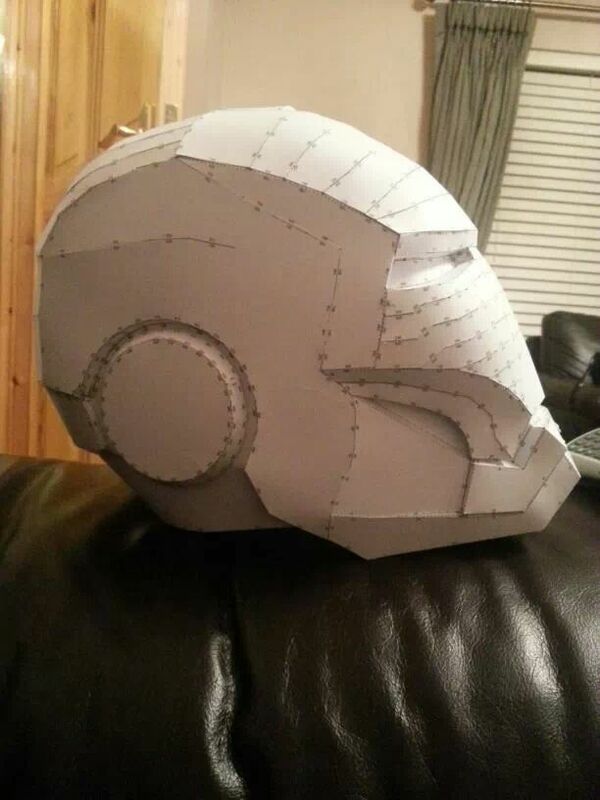 HOMEWORK WEEK ONE: DESIGN AND BUILD A VACUFORM MACHINE, MAKE A PATTERN FOR YOUR HELMET. THE PATTERN MUST BE BE WEARABLE AND AT LEAST 2 PARTS. alright, thanks for setting this up Chris. I guess I am bit eager but I waited a long time to do this so I am getting a bit giddy. Almost went ahead and just bought a vacuum former yesterday (eBay is blessing and curse). But I guess its better to build yer own. Hey, Wolf. You definitely jumped on this one. Personally, I like the ones on the second page better. I think any one from 1-3, 4-7 would work for this project, though I think number 5 is the one I'd make. Here is my first pass at a helmet design. 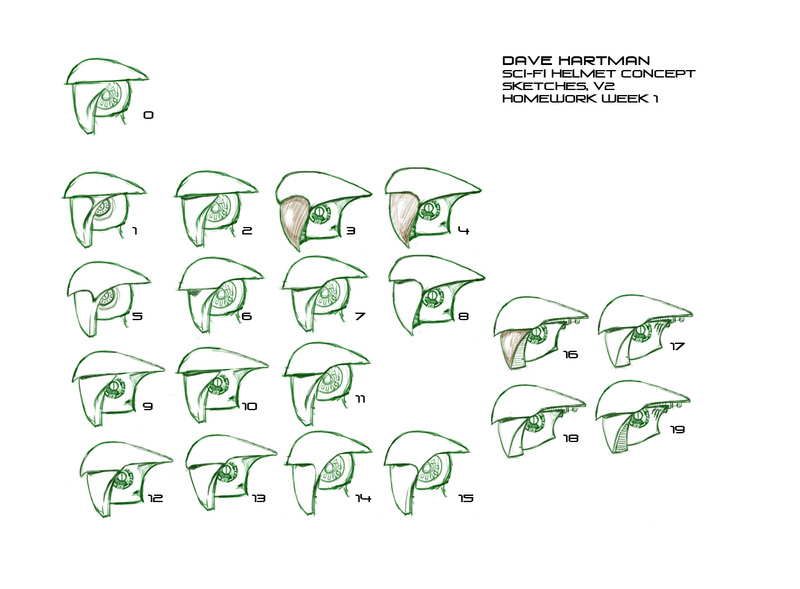 I had just a couple of distinct helmet designs, but most were pretty ugly or looked like some version of Halo. This one, I thought the basic shape was interesting enough to pursue. So, I played with a bunch of derivations of it, tweaking and adding details a little at a time. I wanted to get your impression on it before I tried to finalize the design. 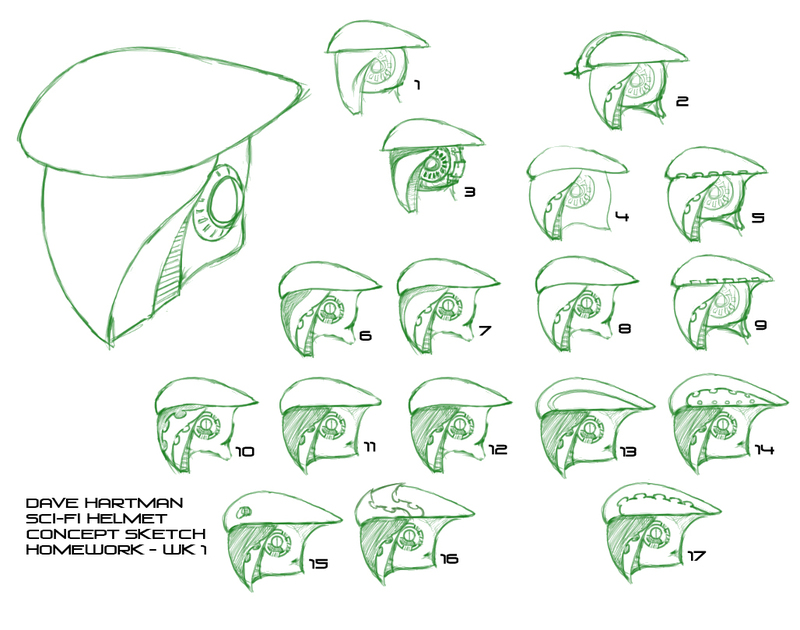 I am leaning toward numbers 16 and 17, which really are only different at the front top of the helmet. I wanted something with a little bit of detail, but not too much as there's still a lot of work that needs to be done. As the design stands, the lower back section needs to flare out a bit to clear the head for donning. Otherwise, I was thinking of making the face plate portion be detachable... Maybe hold it one with some rare-earth magnets. I'm looking forward to your (and the other student's) feedback. Do any of you know the dimensions of the box? 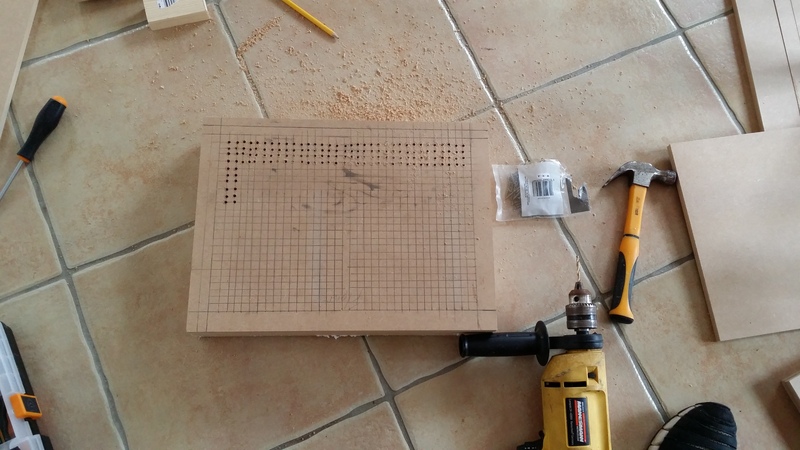 I'm gonna build the whole machine from MDF but need the measurments. I don't think the box (I'm assuming you're talking about just the lower portion that houses the vacuum) has any specific dimensions as it will be dependent upon the vacuum itself. I know that its footprint will be roughly the same size as the frame you are using to hold the plastic, maybe a touch bigger for tolerances. First off, let me say I am really excited to become a member of the Stan Winston School community. I am so incredibly excited to have joined New Deal Studios, where I get to see all the incredible Stan Winston School creatives every day. Your designs are amazing. I would say choose one that you feel confident you can carve easily for this lesson. You may want to create a helmet that rely on softer features and not sharp edges. Vacuum forming has a tendency to round corners when you do pulls. For example someone would be able to create a Stormtrooper much easier than Darth Vader because you would lose the sharpness of Vader's cheeks. In my opinion I think you should do #2 on page one, but don't let me sway you if you feel differently. These are great designs too. Again this is just my opinion, but I'd say less is more with this design and go with #1 on the page. There is something very mysterious about the simplicity of that design. Part of your decision shopuld be base on what impression you want to make with the finished design. If you are building a 12" X 16" frame for your vacuum forming machine, then the box should be 12-1/8" X 16-1/8" X (the height of your vacuum + twice your MDF material thickness with some extra). Let me know if that does not make sense. You probably already know this, but do not use the MDF, wood or any flammable material of any kind in the fabrication of the heater box. The box should ideally be a metal heater box inside an aluminum heat-sink box with a clear path fro heat to escape out the top. We are currently shooting video of the one I am making that you will bw able to see soon. Thanks for the input. I was struggling with this design a bit... I, too, liked the really simple one but I was afraid it was looking a little too much like a beret or bicycle helmet so I started playing with breaking up the different areas. I think I'll go back to the simple one and adjust the lines a little bit instead of adding details/textures. Once I have something that I think will work, I'll flesh out a slightly nicer rendering and re-post it. Now... I need to kill the mouse that is wrecking my shop and then start tearing apart the vacuum and oven I just bought. Thank you very much for the insights. And that you think my designs are amazing. the thing about the edges makes sense. I will reevaluate the designs and try to come up with something that´ll match the class. I have a foam fabricated helmet that is still a WIP but I have ppl that keep bugging me for sales and I´d love to try to tackle that one. I´d like your honest opinion. I know its probably not something that will work as is, but I figured I might be able to use this one to create patterns? At least the base without all the ...... Greebles? Sorry Alan that I misspelled your name in my previous post. I know a few people with the Allen spelling, so I typed it out of habit. Hey Wolf, I think with thr eye peices siting in front of the woman's eyes it makes it pretty unique. Your carving and paint will also keep it from looking like a bike helmet. I know it's far from what we are doing but this i've want to buy was a vacuum form machine and learn to design, sculpt, weathering and installation of electronic. ...can't believe thus course came up!!! Iron Man! One of my favorites. Great design! 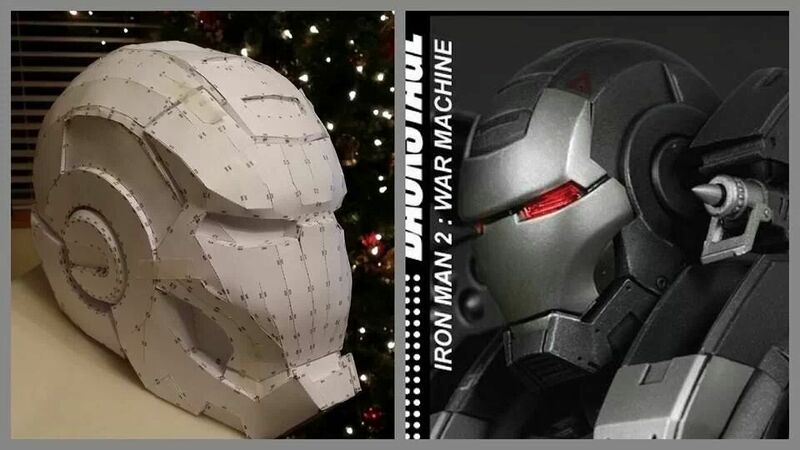 I want a real ironman suit! Fon, I went back to the original, simple thumbnail and played with the lines some. (You can thank my industrial design background for the permutations.) Anyway, my issue with coming up with an interesting design reflects what you mentioned about the message I want to convey with the character... I don't have a character in mind, so it's a challenge to design the helmet around "nothing in particular". That's my issue, but the result was that I merely allowed the design to float along until it started to develop a hint of personality of its own. Most of that personality came across as a forlorn parrot with one of those plastic bonnets my grandmother used to wear to keep the rain off of her hair. The image doesn't really instill much emotion other than pathetic. Regardless, I think numbers 16-19 on this new set look the best. They are all really the same just with some different minor details added for visual interest. I still cannot decide if I like the look of the "menacing eye slits" or the "full face tinted visor" look. My fear is that the eye slits are a bit cliche. Your thoughts? Anyone else have input they'd like to add? Thanks for taking the time, Fon, for doing this course. I know that I'll end up with use out of it! So It starts....building the cavity and im gonna attach a vacuum from the outside! 840 holes to drill ...funk that! hey Alan... Not to rub it in, but I scored a piece of 1/8" perforated stainless steel that was cut to size for only about $40. No hole drilling for me! Aside from all the other jobs I have waiting for me, I got almost all of the materials for the vacuum machine, and I will need a little help (schematics) on the wiring. 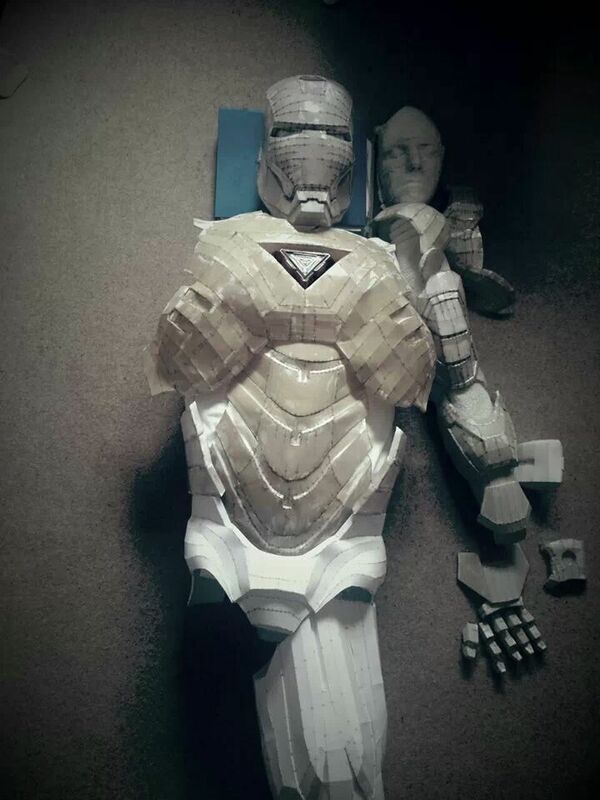 I plan on finishing the machine this upcoming weekend. In a side note: the snow storm we had in Colorado last Saturday wreaked havoc with our cattle that were expecting, and we ended up with 3 new calves that we had to dig out of the snow and help them survive the night... Dave: I like different aspects of all of your concepts. I like the "ear sprockets" you have on concept sheet 1 #6,7,8, and I like the back of the head on #3. As Fon mentioned, though, #1 is really nice in its implied simplicity. On sheet #2, I really like the "Grill" on #19. I hope my ramblings are helpful. Wolf: your foam helmet is wonderful! I can't stop looking at it and wondering where you came up with the design. 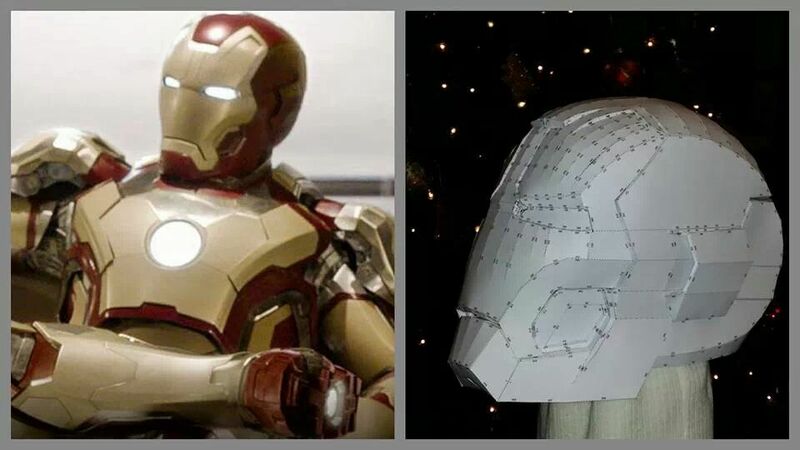 Alan: your Iron Man is insane! WOW! 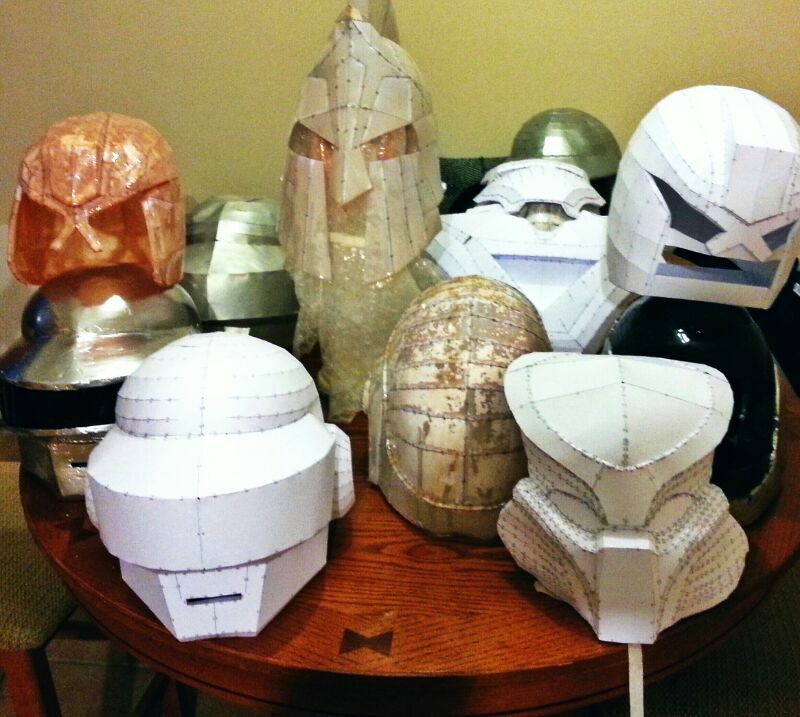 As for my helmet design, I am going to attempt a helm from the Star Wars series. My son wants to be a Biker Scout from Kashyyyk for the upcomming Sci-Fi Convention season. I'll try to find images, but sometimes I work better by just starting to form my piece, and chipping away anything that doesn't belong. Dave, I had the same idea with the pre drilled steel plate but I think I might opt for two above each others as the seemed to bendy. Wow, Rowen. Crazy place you run there. My best wishes for the new arrivals. I am not sure where the design for the helmet came. It just came about when I was putting it together. Looking at it now I´d say my exposure to Star Wars and Predator might have to to do something with it. Fon: Here´s the updated Concept for the No2 Helmet. That was the one you meant, yes?